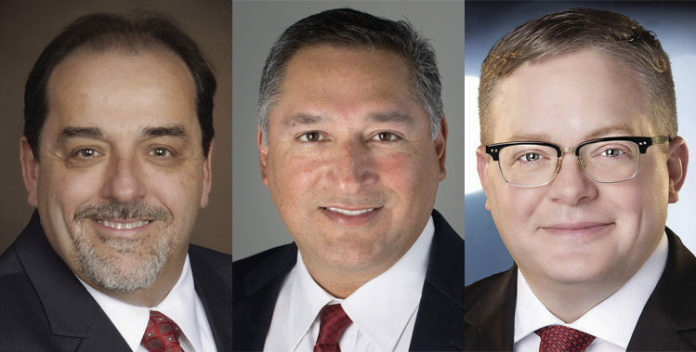 McALLEN — District 1 candidate and businessman Timothy Wilkins outspent the two other candidates by more than 2-to-1, according to the most recent campaign finance reports filed with the city. As of filings made on Dec. 20, Wilkins had spent $41,582 on the District 1 Special Election set for Jan. 20. Physician Joseph M. Caporusso had spent $16,190, while attorney Javier Villalobos had spent $8,484. It’s unclear how much any of them have spent since then. Wilkins loaned himself $30,000, Villalobos loaned himself $20,000 and Caporusso loaned himself $6,000. For context, Wilkins spent $15,000 less than Mayor Jim Darling did at the one-month mark in his mayoral re-election campaign last year. A month before May’s election, Darling spent $55,568. At the same date, challenger Othal E. Brand Jr., son of longtime Mayor Othal Brand, spent $107,149. Brand, who lost the election, donated $1,320 to Wilkins’ campaign, according to filings. In the District 2 commission race on that same May election ballot, District 2 incumbent Commissioner Trey Pebley had spent $17,283 at the one-month mark. His challenger, Joaquin “J.J.” Zamora, spent $7,831 at the same point. Early voting for the Jan. 20 special election begins Wednesday and will last until Jan. 16. Early voting locations for the northeast McAllen district include Firemans Pump House, Palm View Community Center and Lark Community Center. District 1 Commissioner Richard Cortez vacated his commission seat to run for Hidalgo County judge. This story was corrected to reflect that District 1 candidate Timothy Wilkins outspent the two other candidates by more than 2-to-1.